David Granger speaking with reporters yesterday. 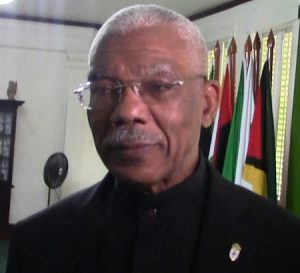 President David Granger claimed full responsibility for the secrecy surrounding the U.S. $18 million signing bonus from United States oil giant, ExxonMobil. Speaking with reporters for the first time since Government was forced to come clean on the bonus, the President noted that some members of Cabinet may have been unaware of the existence of the signing bonus. “I am the head of Government. I am responsible. I am aware of it. It is legitimate Government of Guyana exercise,” the President stated. Chartered Accountant, Christopher Ram was first to come public that Government had received a signing bonus. At the time, Ram had claimed the amount to be U.S. $20 million. Minister of Finance, Winston Jordan, and Natural Resources Minister, Raphael Trotman never admitted to the existence of the bonus despite being asked repeatedly by the press corps. “I am not sure that all the ministers were aware of the transaction,” the President pointed out. Last Friday, a leaked letter addressed to Central Bank Governor, Dr. Gobind Ganga, and dated September 20, 2016, surfaced. The letter showed that a request was made for the opening of a foreign currency account to receive a signing bonus from ExxonMobil. Finance Secretary, Dr. Hector Butts, made it clear that the Bank of Guyana should not treat the money as part of its reserves. “There were some national security implications. That is the only reason why it was transacted in that manner and I am responsible for national security; it is my decision,” Granger stated. The President noted that the monies are for a legitimate exercise to be used for certain matters which Government perceives to be of national security interest. Trotman has since indicated that the monies are being kept to assist Guyana with its border controversy with Venezuela. The President stated that he is aware that the money is in the Bank of Guyana in escrow. “Once it is in an escrow account it means that it cannot be used for purposes for which it is not intended. As far as I am concerned it is legitimate Government of Guyana practice and the money has not been dishonestly acquired and will not be used for purposes for which it is not intended,” President Granger stated. “At that point in time it was the thing to do so we can have access in the event of a national security emergency,” Granger stated. Asked about the decision to keep the funds secret although Government had several opportunities to admit to its existence, Granger noted that evidence of nondisclosure does not mean there is evidence of any intention of deception. “There is no intention to deceive, but there was no need to make it public. It is a Governmental decision. I make Governmental decisions all the time, but it is not deceptive. The transaction was conducted on Government letterhead paper between two state agencies – the Bank of Guyana and the Ministry of Finance – it is not a secret,” President Granger maintained. Since the Ministry of Finance letter surfaced, Ram has called for the intervention of the police and an apology from Granger. The Chartered Accountant noted that the forced admission by the government is a shocking revelation of a conspiracy to deceive the people of Guyana about billions of dollars, involving a galaxy of ministers. He said that there are immediate and longer term implications for Guyana, including a violation of Article 216 of the Constitution of Guyana.